In 5-quart Dutch oven, place potatoes; add just enough water to cover. Heat to boiling. Reduce heat; cover and simmer 10 to 15 minutes or until potatoes are very tender. Drain. Reserve 1 cup potatoes; return remaining potatoes to saucepan. In small bowl, mash reserved potatoes with fork; return to saucepan. Stir in broth, salt and pepper. Heat to boiling. Add broccoli. Return to boiling; cook uncovered 4 minutes, stirring occasionally. Reduce heat to medium. In small bowl, stir flour into milk with wire whisk until well mixed. Add milk mixture to potato mixture, stirring constantly. Cook over medium heat, stirring frequently, until mixture thickens and boils. Stir in cheese until melted and smooth. Stir in sour cream and green onions; cook until thoroughly heated. 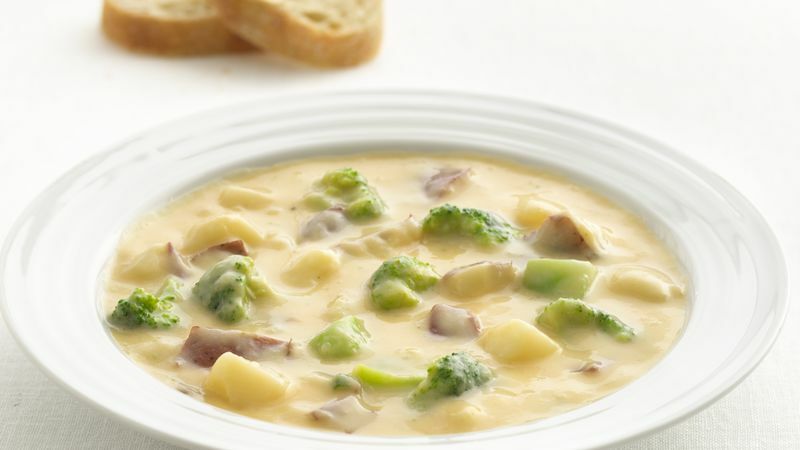 Because red-skinned potatoes are firmer and will retain their shape better than russets, they are the best choice for soups or chowders such as this. *For better melting cheese, we recommend using brick cheese and shredding it yourself instead of using preshredded cheese.